THE GALAXY EXPRESS: Calling All Space Wenches! In the post, not only does Ms. Fox demonstrate her esoteric knowledge about Grace O’Malley, but she discusses her interest in reading stories about “she-pirates”—wait for it—in space! Has she got her finger on the pulse of science fiction romance, or what?! Except...there aren’t that many. Luckily, a few visitors commented with book recommendations (and in my case, a shout out for Space Pirate Queen Emeraldas). Apparently, we can count the existence of this character in literature on practically one hand. It boggles my mind that with all the thousands (millions?) of romance and SF titles published since seemingly time immemorial, there haven’t been at least 100 involving female space pirates. Well, okay, perhaps that expectation’s a bit high. How about 10-20? My sentiments exactly. If you know of such a character, please head on over and add your recommendation to her list. I did my own search, and found SOL BIANCA, another anime offering. But that’s film, not print. Then I stumbled upon the comic LESBIAN PIRATES FROM OUTER SPACE—that’s got to count for something, right? You might also remember we gabbed about Super Vixens! in our favorite science fiction romances, but there was hardly a female space pirate among that list, either. Ms. Fox’s post also made me realize that I’ve been existing on the equivalent of bread and milk when it came to female space pirates. In other words, it’s one of my favorite character types but I haven’t actually embarked on a steady diet of them. I’m in love with the idea of “space wenches” more than any actual product. Oh, gosh, now I’m really bummed. * Characters like female space pirates, a.k.a. anti-heroines, threaten to overshadow/overpower the hero and therefore many readers would shun them. 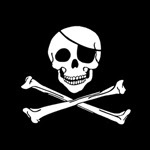 * Pirates are not nice people, even if by story’s end they’re no longer a villain. A cutthroat female space pirate character might be perceived as a threat to readers of both genders, but for different reasons. Men might feel emasculated and women might have difficulty identifying with a character that crushes gender stereotypes beneath her black leather boots without even breaking a sweat. * Some people don’t even realize real female pirates existed, let alone would be interested in reading about fictional ones plundering the cosmos. * Aside from their cutthroat reputation, space pirates in general might be considered too over the top/campy characters. * Science fiction romance is still a niche market. What say you, my intrepid passengers? Why do so few of these characters exist? Is the female space pirate character that bizarre of a concept? Or is the timing—culturally, socially—just not right? Whatever the reason, we can hope that some day, in a bookstore near you or me—or online, or in a library—we’ll have our pickings of indomitable female space pirates.